Although mouldings are decorative, they still play a major role in maintaining a home’s structural integrity. Trim Team provides a variety of moulding options to homeowners in the Southwest. We have middle density fiber (MDF), finger joint wood (FJ), and solid wood mouldings available in different profiles and sizes, all depending on your project and home specifications. We also offer specialty millwork for custom jobs such as mantels, decorative ceilings, wainscot walls, and more. Our clients deserve the best of the best and we are able to achieve this through our custom moulding services. Middle density fiber (MDF) is an inexpensive option that can give off a look similar to that of real wood. Through staining or painting, it can look similar to real wood, without a steep price tag. MDF is a great option for mouldings because it’s provides the look and feel of real wood at a fraction of the cost. Saving money on the moulding for your home project will allow you to maintain your budget. Since MDF isn’t as strong as real wood, professional installation services are required. Trim Team provides this as well as color consulting to produce the desired result. Finger joint wood mouldings (FJ) are another relatively inexpensive option that won’t warp or twist. Since FJ mouldings are made from solid wood, they are factory-primed and can be sealed with latex or oil-based primers. Due to their design, FJ mouldings are able to be joined together, interlocking to provide greater stability. Moulding and millwork can be seen around doors, windows, and along walls. 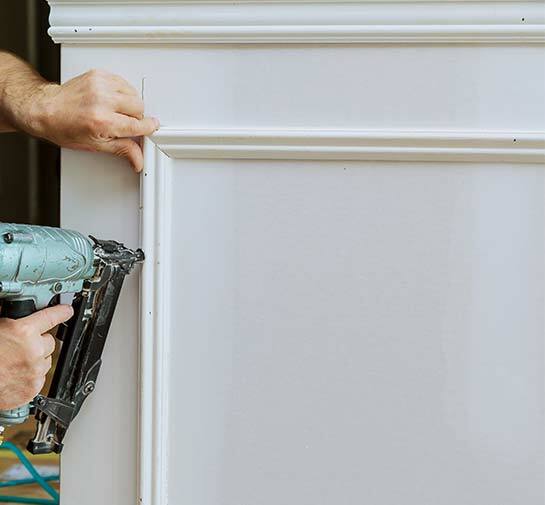 Trim Team provides custom moulding services to allow homebuilders and remodelers to achieve a dignified, original look that will connect the entire room. Although mouldings may seem like miniscule, inconsequential details, they can work wonders on rooms of all types. Being able to customize the moulding to fit a desired shape or style will bring more personality and stability to the project. Trim Team not only provides the windows and doors, we also bring it all together with our moulding and millwork services.